PHILADELPHIA (AP) Boston had an opening week it would love to do over: Gordon Hayward, its prized free-agent signing, was lost to a gruesome injury, and the Celtics lost their first two games. On the ropes against a 76ers team looking to prove ”The Process” is more than a catchphrase, Kyrie Irving gave a glimpse why he may be the man in Boston that he so longed to be in Cleveland. Irving scored 21 points, Al Horford had 17 and the Celtics won for the first time since losing Hayward, 102-92 over Philadelphia on Friday night. The Celtics lost to Cleveland in their opener when Hayward went down with a mangled ankle that may cost him the season, and then lost to Milwaukee. Horford and Irving took over down the stretch to quiet a raucous 76ers’ crowd in the home opener. Irving made the shots he needed to make in the fourth. ”C’mon, man. 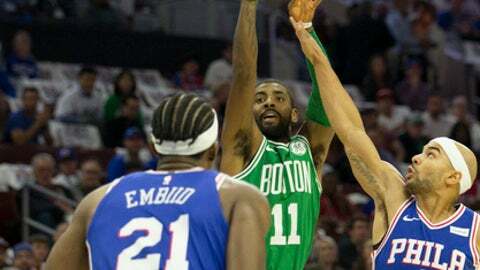 That’s winning time, man,” Irving said. Jayson Tatum scored 15 points and had Terry Rozier III had 14 to keep the Celtics afloat with a makeshift lineup. Boston snapped a tie game with an 11-4 run late in the fourth that steadied a franchise still reeling from Hayward’s injury. Joel Embiid knows the feeling of missing an entire season. The Sixers center missed his first two NBA seasons with foot injuries and was limited to 31 games last year. Healthy and ready to play, Embiid had one of his worst offensive games as a pro, with 11 points on 4-for-11 shooting. He strayed from the low post and missed all six 3s in 28 minutes. Moments after he checked in late in the third, Embiid drove past Horford for his first basket of the game and a 65-56 lead. Embiid missed his first eight shots – he spent more time exhorting the fans to chant ”Trust the Process,” – before he gave the fans a real reason to cheer. He did grab 14 rebounds. Already playing short-handed, the Celtics wasted points with a 15-of-25 effort from the line through the third quarter. Aron Baynes slipped in for a tip-in at the horn when Embiid failed to box out that cut Philly’s lead to 72-69. J.J. Redick led the Sixers with 19 points. Years of some of the worst basketball in NBA history have at last yielded a Game 7 enthusiasm for the Sixers. The Wells Fargo Center was sold out and fans tailgated in the parking lot hours before tipoff, giving it a Philadelphia Eagles feel. A few Eagles even showed up to ring the ceremonial Liberty Bell during pregame intros and fans whipped their giveaway T-shirts into makeshift rally towels as the arena rocked much like it did in the Allen Iverson era. Embiid, still looking to get his legs after seven months of inactivity, lumbered in an 0 for 5 first half. The 2017 No. 1 overall pick Markelle Fultz – with a hitch in his free-throw shooting – earned a rousing ovation simply for making shots from the line. Redick kept the Sixers in the game with three 3s that showed why the Sixers gave him a $23 million contract. Embiid’s final shot of the half was a wild airball that was snared by Dario Saric and put back for the bucket and a 50-46 lead at halftime. ”We let one go,” Sixers coach Brett Brown said. Celtics: Coach Brad Stevens said Hayward was released from the hospital. Hayward suffered a broken left tibia and dislocated ankle on opening night in Cleveland. … G Marcus Smart sat out with an ankle injury. Baynes got the start. Horford missed 11 of 16 shots but hit three 3s and teamed with Irving to turn the tide for the Celtics. Actor Samuel L. Jackson and director M. Night Shyamalan were at the game. Rapper Meek Mill also was at the game. Celtics: Are off until Tuesday when they host the Knicks. 76ers: Play Saturday at Toronto.